When your child has the sensation of clogged, full, and troublesome ears, it can be distracting and annoying for them. 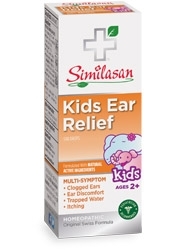 Give them temporary relief for their symptoms with Similasans Kids Ear Relief homeopathic ear drops, a solution created just for them. Kids Ear Relief ear drops help clear water trapped in their ear and the homeopathic ingredients help stimulate their body's natural ability to soothe the ear, decrease the ear's sensitivity to external factors such as water, cold, and drafts, reduce the clogged sensation in the ear. For over 30 years, our Original Swiss Formulas − formulated with natural active ingredients − have been providing families with remedies they can trust. Squeeze plastic applicator to apply 4 to 5 drops in each affected ear (applicator should not enter ear canal). Keep this and all medications out of the reach of children. If swallowed, get medical help or contact a Poison Control Center right away.